No email this week. Elder Himes was too busy with a transfer. 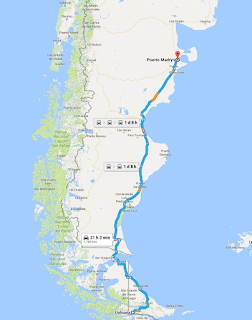 He is going from Ushuaia to Puerto Madryn. Remember a while back when he had to travel from Ushuaia to Comodoro Rivadavia and back and he thought that was a long trip? Well, this is even longer. He is going from the southern most point in the mission (or the world according to some) to the northernmost area.